In April 1988 gas cost $.91 per gallon in the U.S. and the median price of an existing home was $90,60. 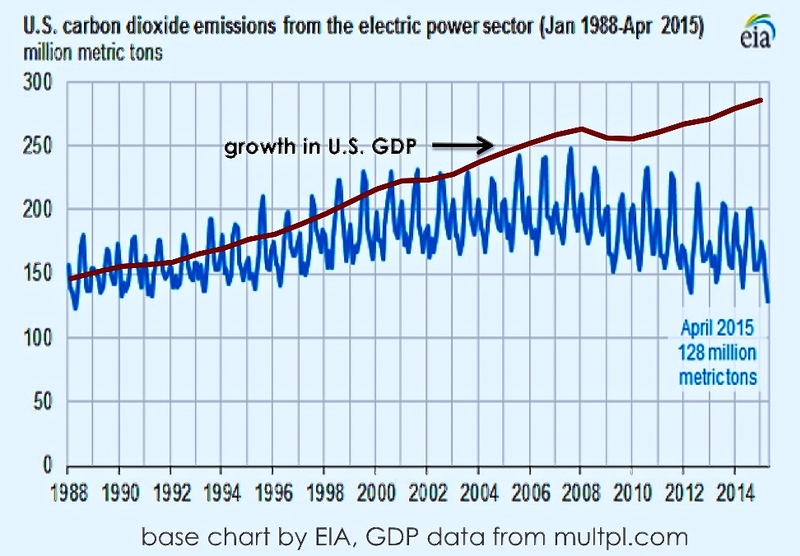 Although, real GDP adjusted for inflation increased by 95% between April 1988 and April 2015, U.S. electricity power plant CO2 emissions were still at approximately 1988 levels. After steadily growing between 1988 and 2007, power plant CO2 emissions have generally been decreasing since around 2008 according to data from the U.S. Energy Information Administration (EIA). Initially, the downturn in the economy due to the great recession was cited as the reason. But GDP has been rising since late 2009 while CO2 emissions have continued to fall. Rather than being due to aggregate economic performance, it appears that CO2 emissions grew more slowly than GDP (33% and 81% respectively) from December 1987 to December 2007 generally because of pollution control regulations. Those regulations caused a slow shift away from coal-fired electricity generation as the worst polluting coal plants were retired. Since 2009, and especially more recently, that trend has additionally been motivated by lower natural gas prices which have accelerated the switch away from coal. The implementation of the EPA’s Clean Power Plan (CPP) is expected to result in additional significant decreases in coal-fired generation in the future.